Recently, I couldn’t make up my mind on selecting a new day bag for my adventures. I didn’t want a big survival backpack like the RUSH 72, I just wanted something smaller for when I’m just going out for the day or just for overnight. I took to a bunch of forums, Facebook, and some groups about what they thought the best bug out bag was. 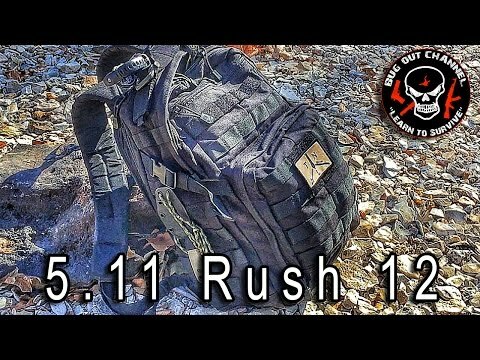 So When I finally compiled all the answers, I found that the 5.11 tactical RUSH 24 backpack was the one that everyone mentioned. I finally managed to get my hands on one to see what everyone was talking about, and to give you my honest opinion on this type of bag. For the longest time I had been using my old Camelbak BFM for over a decade now. It has been so long that I couldn’t even find a link to the exact model that I have but one that was close to it. The one that I have actually has smaller pockets than the newer models, which is what made me want a new bag so bad. 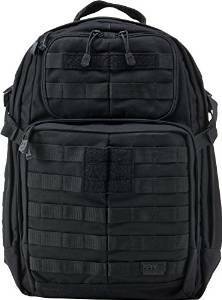 The 5.11 tactical RUSH 24 backpack is an iconic bag. This happens to be the most popular MOLLE bags out there. Most of us have probably owned one of these, but the new updated versions are quite nice. 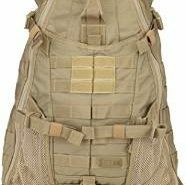 I love that it had MOLLE webbing everywhere, which gives it a lot of versatility. The RUSH 24, has a lot of internal organization that if you add more pouches to the outside, it is basically unnecessary and it will clutter up the bag. There are upper compression straps that you can use to compress your bag when you aren’t trekking with a full load. They do a pretty good job even though having both upper and lower straps would have been better. Strap management is the key when it comes to this bag. The RUSH 24 comes with elastic keepers and tier straps. Everything will cinch up nicely and very neat, and it is basically integrated. There is a yoke harness that does an awesome job of distributing the load across your shoulders evenly. The shoulder straps are padded and adjustable. I love the fact that there is an option of a sternum strap which you can remove, if you want. There are even attachments for a waist belt if you want. The Admin pouch, it was great for a low profile and durable pack that gives access to items that you use often without having to get in your bag. It has great retention and non-zippered access so, someone who is behind you can’t just steal your items. 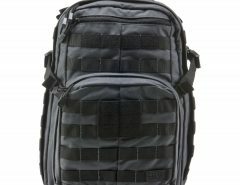 This is one of my favorite bug out bags and from a value standpoint, there are not many out there that rival it. The RUSH 24 cracked the code for the two strap versatility as well as capacity with this bag. Is it perfect? Not really, because it isn’t great for those who commute to work because there isn’t a laptop sleeve in it. 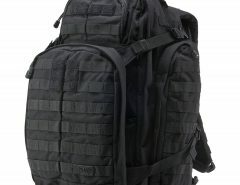 Plus, it looks like a tactical bag, which isn’t great for those who work in the office. Other than that, it is a great bag.